ShBlog: Be ready to be shaken! It's been a week of big earthquakes on the so-called "Ring of Fire," starting with a massive 8.0 shaker in the Solomon Islands chain (which sent a small tsunami crashing through and destroying hundreds of homes, killing at least 9 people), hundreds of aftershocks (many 7.0 or larger), followed by a major quake in South America's Colombia and Ecuador this morning. My colleagues have been discussing this and I've been thinking about a couple of blogs I wrote last year, speculating about how we here in the Northwest are overdue for a major quake on the Cascadia Subduction Faultline (50 miles out to sea, west of the state). The last time this fault let loose was in January of 1700; the estimated 9.0 quake released enormous tidal waves that inundated fishing villages in Japan, and the entirety of Vancouver Island was shifted an estimated 15 feet south of its previous position. Scientists estimate this fault has slipped catastrophically, an average of about every 300 years or so over the last 10 millennia. So we are currently due for another big hit. As someone who works for an organization specializing in disaster relief and recovery, I've put a lot of thought into being prepared. Therefore I thought today I would share with you my recommendations for being prepared. Many if not all of these you have probably heard before, but it can't hurt to state the obvious. My wife and I have a fairly variable work schedule. We each work outside of the home at least three days each week (different days). She works at three different schools. If a large quake struck while one of us was at work, making communication difficult or impossible, I would really want to know where she was. So recently we have been beginning each day, touching base on our whereabouts. "What are your plans for the day? Where will you be, when?" And I've been making more of an effort to pay attention. I would like to do the same thing, as well, with both of my kids and their spouses. If the big one strikes, it might minimize my efforts to find them or my worrying about where they might be. Experts also tell us we should plan on a strategy for meeting or touching base (communicating our status and whereabouts). And be sure and communicate your strategy to those you love. I am trying to carry my cellphone at all times now, and make sure it's well charged. It might be impossible to get a call out, but my primary plan is to tweet out my status and whereabouts. Such technologies are more likely to remain "up" longer in a major emergency, and are accessible to anyone with an internet connection. I am letting people I love know they can check http://twitter.com/LarryShort to get updates in an emergency. I am also suggesting to all my friends and loved ones that after any disaster, if possible they send a quick text message with their status/location, and the sooner the better. Experts suggest a minimum three-day supply of food and water, kept with you wherever you are. This is less easy to do in the office than it is at home, but I do try and keep power bars and bottled water in a desk drawer there, as well as in my briefcase. I also keep a flashlight in my briefcase. My brother has built a cool device and I am hoping he will get me one for Christmas. It's a USB charger that uses AAA batteries, in a small mint tin, which you can use to connect to your cellphone with a USB cable and trickle charge it. This would also be a very handy thing to keep in case of an emergency. At home, we've decided a generator is a worthwhile investment. Our power goes out so frequently that a generator keeps us in business, on the internet and in communication, not to mention warmed and fed. If you use a generator, be sure to modify your home's electrical system, hiring a qualified electrician to wire you a generator switching panel, so you don't accidentally feed power back into the lines and electrocute some poor utility worker who is trying to repair the damage in your neighborhood. We also use our Costco membership to buy larger-than-necessary quantities of foodstuffs that will keep (canned beans, fruit, etc. ), and store these in our pantry and on sturdy shelves in the garage. Along with a 30-gallon plastic water container, and an extra case of bottled water, we are well supplied at home for any emergency lasting at least three days or potentially much longer. For non-drinking water needs, we have a spa with 300 gallons, and a water catchment system that works off our rain gutters and stores another 50 gallons. But in the event of a large earthquake we would probably also quickly fill up both bathtubs. 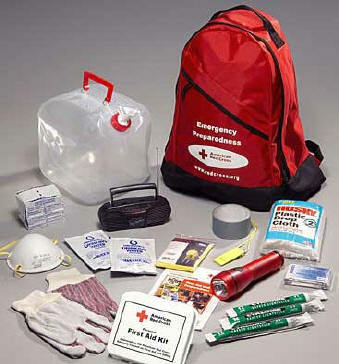 Other things recommended for your emergency kits: plenty of first aid supplies, lots of duct tape and plastic sheeting in case you need to seal doors, windows and outlets against any potential radioactive, chemical or biological nuisance. Also a battery-op radio, flashlights and plenty of batteries. I am also a proponent of personal security measures that will help keep your household safe in case of a civil emergency. We employ a series of motion-activated driveway lights and cameras, backed up by firearms and the training to use them, for this purpose. One of the responsibilities I take seriously as a husband, father, and neighbor is to keep my family and my neighbors safe, if the power lies within me to do so. Most of us also spend a fair amount of time in our car, so I've also through through various disaster scenarios and how my vehicle (and what I carry in it) might help me. In addition to a storebought vehicle emergency kit which provides first aid, tools, lighting, flares, etc., I also carry additional food and water, a strong tow strap, more extensive first aid supplies, etc. I do recommend that people keep some sort of commodity or cash on hand that would be "liquid" in the event of an emergency. Realize that in an emergency, whatever you have on hands is what your total resources for survival might be. The banks will be closed, store shelves will be empty, etc. You may not have any utilities, You may have to exist on what you have. I don't keep a lot of cash on hand, but I do keep in a secure place some items that would be "better than cash" in case of a true large-scale emergency. One never knows -- you might be able to barter or trade these items for other things I might need, or for passage to a safe place. I've read that when South Vietnam fell to the north, those who survived were those who had gold coins on hand they could use to secure passage to freedom. Finally there is the matter of disaster recovery. You need to plan to be covered against the key risks you face. If you own a home or rent an apartment, make sure you maintain homeowners or renters insurance that will protect you against loss caused by fire, theft, etc. If you are in a flood zone, you need flood insurance. I am also convinced that if you can afford it (and it costs about $500 a year), earthquake insurance in this area is particularly wise. Your normal insurance will not cover earthquake damage. 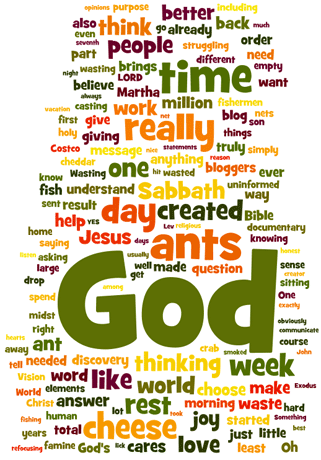 You might think this is all a little over-the-top and that I must spend a lot of time worrying about the unthinkable. But I really don't. Right now I am reading a book about human resilience and how people react to disasters, called "The Unthinkable." The author makes the very good point that people who think about and prepare for potential disaster scenarios are much more likely to be able to survive them and help others, not only by being prepared, but by keeping a cool head in the midst of the crisis. If you have prepared for something, you are more confident if and when it happens, and you don't need to waste any energy worrying about the unthinkable. And one final admonition: We do not often reflect on how truly vulnerable we are to those unknown disasters waiting to happen. And in truth, you can only prepare so much. Therefore I am learning to train myself to turn to God first during times of crisis. Too often in the past I have had an accident and have waited too long to turn to God for help. I could tell you several miraculous stories about how the situation changed so quickly for me when I did, finally, cry out to God during a crisis. He wants us, ultimately, to rely not on our own resources or even preparedness, but on His grace and mercy in a time of crisis. I can face disasters with confidence because I know I serve a God who is much bigger than any potential disaster could ever be!